‘formed in 1988 as a result of three of the women getting together to start a women’s music workshop, Meet Your Feet played its first gig in June 1988, when asked to get a set together for a Benefit Gig against section 28. This gig was so successful that the band decided to stay together and gradually the original line-up of the early years of the band evolved: Carol Thomas, vocals; Diana Milstein, founder member, bass and lyricist; Diggy, percussion; Heie Gelhaus, founder member, keyboards and songwriter; Julie Lockhart, vocals; Karen Keen, sax; Sue Hewitt, founder member, drums and songwriter; Vicki Burke, sax’ (taken from the Women’s Liberation Music Archive). 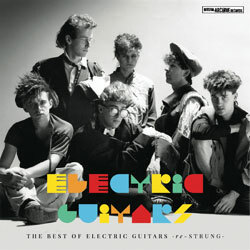 During the 80s the band achieved great success and performed at prestigious festivals such as Glastonbury and WOMAD, as well as appearing on Radio 4’s Women’s Hour. 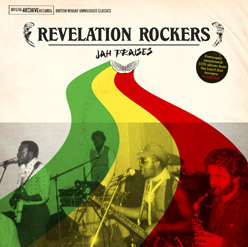 They played together until 1992 before disbanding, reformed in 2010 and continue to play shows in Bristol and beyond. Meet Your Feet’s style, which draws from Latin, Jazz and Soul influences, interspersed with passionate, upbeat political lyrics, align them with other ‘women’s music’ bands from the 1980s, such as The Guest Stars and Hi-Jinx. Meet Your Feet from Adrian Finn on Vimeo. The video clip we digitised is interesting because it indicates how novel women’s bands were in 1990. Can you imagine an all male group being asked a similar question in a television interview, either now or in the early 1990s?! It just wouldn’t happen because no one notices if all the members of a group are male, it just seems completely normal. Presenter: Are there any real advantages to being an all female group? Presenter: Do you row a lot because you are on the road, its a hard life isn’t it, very intense? Julie Lockhart: No, that’s the obvious difference we never row! Presenter: Do you find it hard to be taken seriously by men who come to see an all girl band? It is frustrating that such questions had to be asked, and maybe they wouldn’t be now – although it is still often the case that in music, as in other areas of cultural life, women’s gender is marked, while male gender is not. We have all heard, for example, the phrase ‘female-fronted band’. When do we ever hear of bands that are ‘male-fronted’? It is really valuable to have access to recordings such as those of Meet Your Feet, not only as a documentation of their performances, but also to demonstrate the attitudes and assumptions that women faced when they participated in a male dominated cultural field. It is also good to know that Meet Your Feet are still performing and undoubtedly upsetting a few stereotypes and expectations along the way, so make sure you catch them at a show soon! Bristol Archive Records is more than a record label. It releases music, books and through its website, documents the history of Bristol’s punk and reggae scenes from 1977 onwards. You can get lost for hours trawling through the scans of rare zines and photographs, profiles of record labels, bands, discographies and gig lists. Its a huge amount of work that keeps on expanding as more tapes are found, lurking in basements or at that unforeseen place at the back of the wardrobe. Great Bear has the privilege of being the go-to digitisation service for Bristol Archive Records, and many of the albums that grace the record store shelves of Bristol and beyond found their second digital life in the Great Bear Studio. The tapes that Mike Darby has given us to digitise include ¼ inch studio master tapes, ½ inch 8 track multi-track tapes, audio cassettes, DAT recordings and Betamax digital audio recordings. 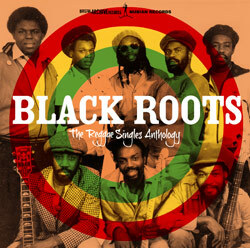 The recordings were mostly made at home or in small commercial studios, often they were not stored in the best conditions. Some are demos, or other material which has never been released before. Many were recorded on Ampex tape, and therefore needed to be baked before they were played back, and we also had to deal with other physical problems with the tape, such as mold, but they have all, thankfully, been fixable. After transfers we supply high quality WAV files as individual tracks or ‘stems’ to label manager Mike Darby, which are then re-mastered before they are released on CD, vinyl or downloads. While Darby admits in the interview that Bristol Archive Records is not exactly a money spinner, the cultural value of these recordings are immeasurable. 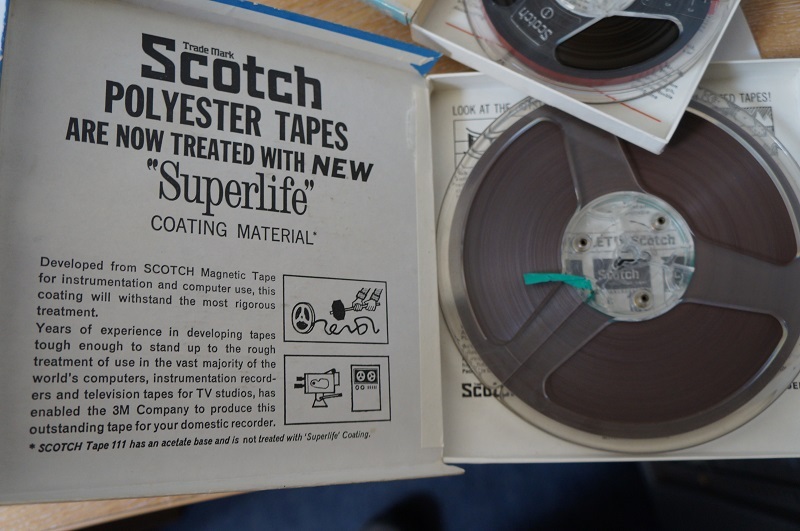 We are delighted to be part of the wider project and hope that these rare tapes continue to be found so that contemporary audiences can enjoy the musical legacies of Bristol. We recently digitised a collection of 1/2 inch EIAJ skipfield reel to reel videos for Dr Stephen Bell, Lecturer in Computer Animation at Bournemouth University. CLEWS SB 01 from Stephen Bell on Vimeo. Nice to have a satisfied customer! 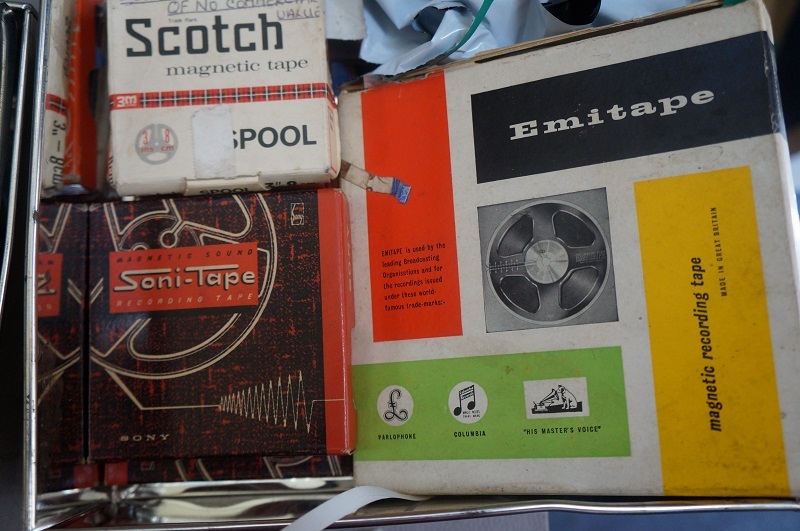 We were recently sent a collection of 7″ 8-track reel-to-reel tapes. 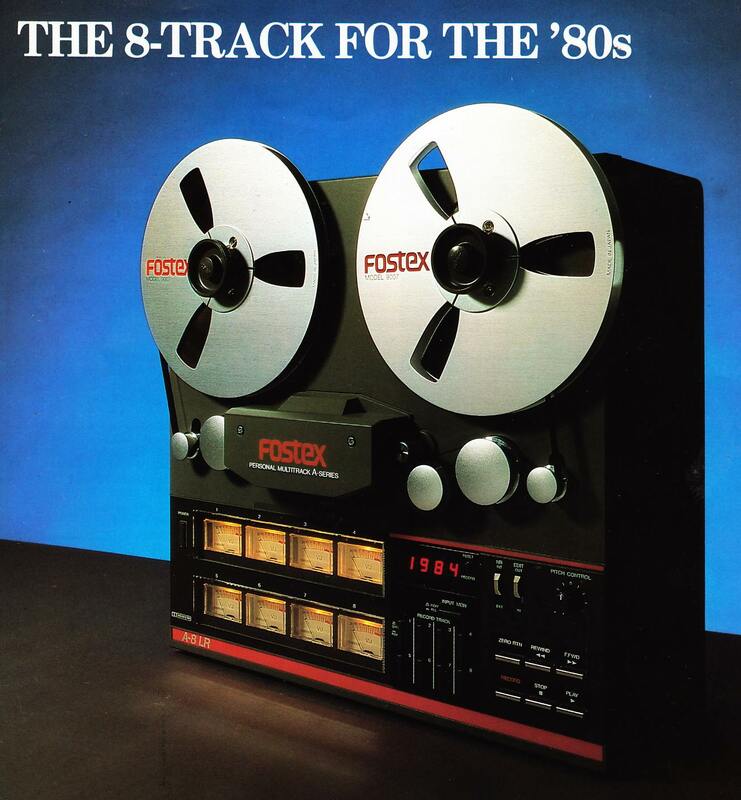 All the 8-track tapes were recorded using Dolby C noise reduction on a Fostex A8 machine. 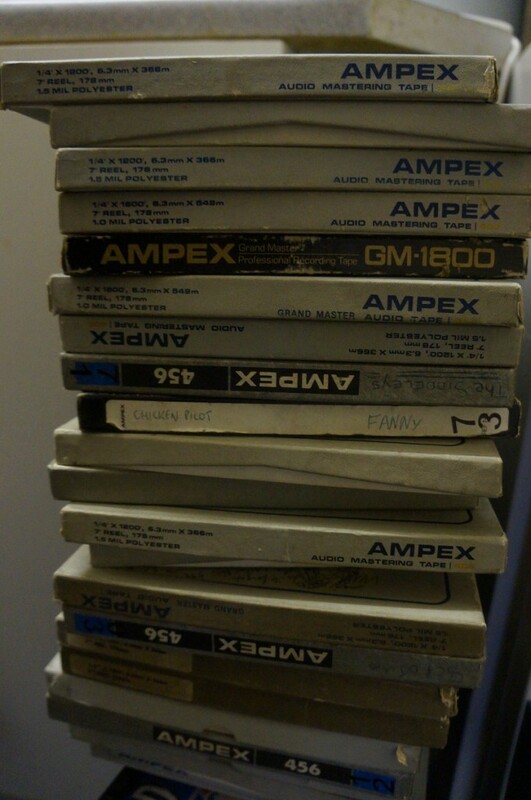 They haven’t been stored in optimum conditions and as many were recorded on AMPEX tape, they need to be baked prior to transfer in order to treat their probable binder hydrolysis. The A-8 was part of the home recording revolution that took the 80s by storm. The A-8 in particular was popular because it was the first machine to offer eight tracks on just one 1/4″ tape. The machine, like its ‘first mate’ the 350 Mixer, were not meant for professionals but enthusiastic amateurs who were happy to work things out themselves. ‘Sure you won’t know everything right off. But you won’t have to. Just hook up to the 350 (our instructions are easy and explicit) and go to work. You can learn the key to incredible flexibility as you go. While you are working on your music. Not before,’ were the encouraging words in the 350 mixer manual. 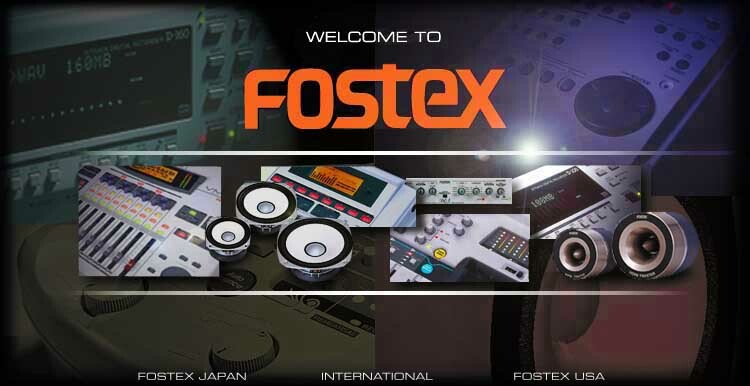 Products like the Fostex A-8 enabled bands and artists who would never have got a commercial record deal to record their music. All sorts of weird and wonderful sounds were recorded on multi-track tape recorders, and they often received airplay on John Peel‘s radio shows. When we transfer reel-to-reel multi-track tapes we save each stem individually, so you can remix the recordings digitally if you want to. If you spent far too much time in the early 80s playing with your home studio and have a load of old tapes lying in your cupboard, we can help give them a new lease of life. With Ampex tapes in particular, it is critical to transfer them now because they will deteriorate quickly if action is not taken soon. 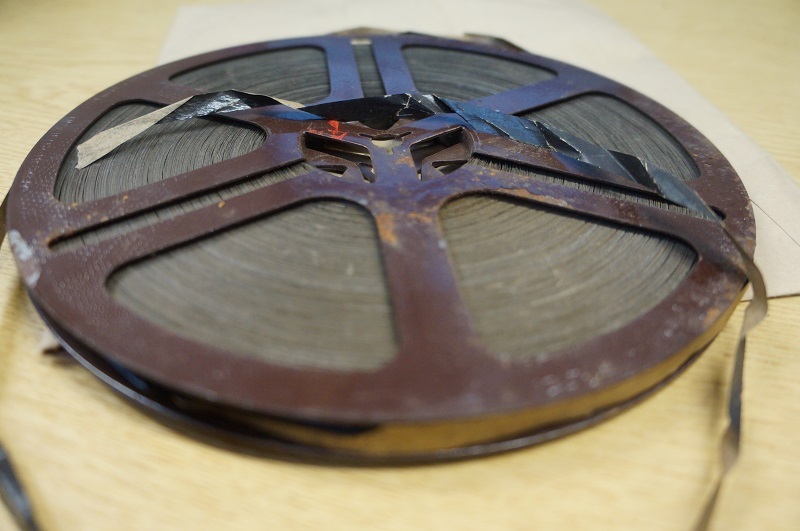 The oldest tape we have received at the Great Bear is a spool of paper backed magnetic tape, c.1948-1950. Its pretty rare to be sent paper backed tape, and we have been on a bit of adventure trying to find more about its history. On our trail we found a tale of war, economics, industry and invention as we chased the story of the ‘magnetic ribbon’. The first thing to recount is how the development of magnetic tape in the 1930s and 1940s is enmeshed with events in the Second World War. The Germans were pioneers of magnetic tape, and in 1935 AEG demonstrated the Magnetophon, the first ever tape recorder. The Germans continued to develop magnetic tape, but as the 1930s wore on and war declared, the fruits of technological invention were not widely shared – establishing sophisticated telecommunication systems was essential for the ‘war effort’ on both sides. In the United States in WW2, significant resources were used to develop magnetic tape. ‘With money no object and the necessity of adequate recording devices for the military, developments moved at a brisker pace’, writes Mark Mooney. This where our paper tape comes into the equation, courtesy of Polish-born inventor Semi J. Begun. Begun began working for the Brush Development Company in 1938, who were one of the companies contracted to develop magnetic tape for the US Navy during the war. 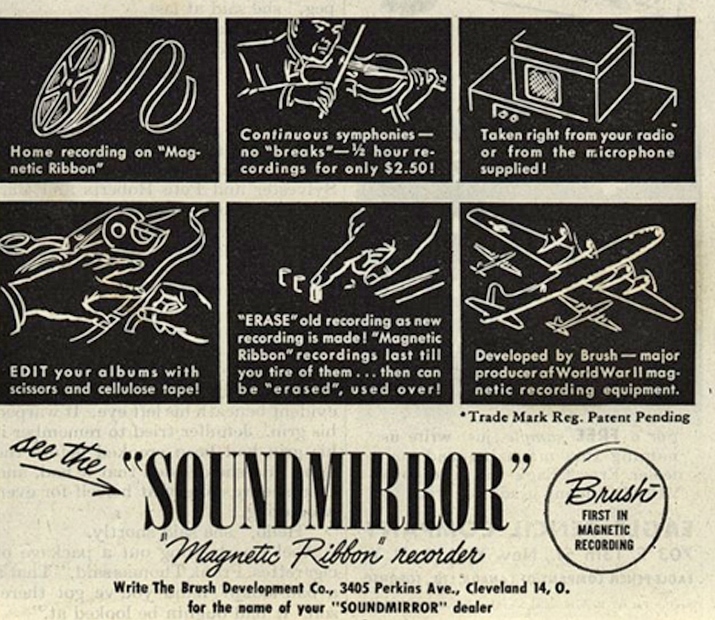 In his position at Brush Begun invented the ‘Sound Mirror.’ Developed in 1939-1940 but released on the market in 1946, it was the first magnetic tape recorder to be sold commercially in the US post WW2. As the post-war rush to capitalise on an emerging consumer market gathered apace, companies such as 3M developed their own magnetic tapes. 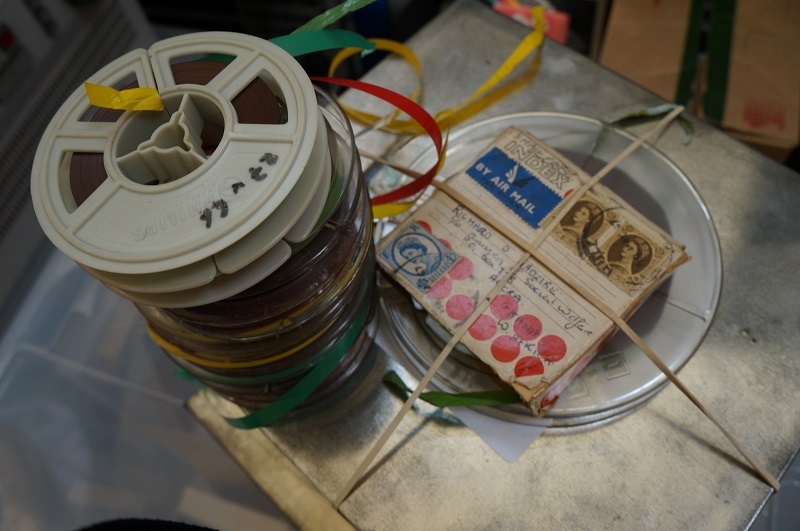 Paper backed magnetic tape was superseded toward the end of the 1940s by plastic tape, making a short but significant appearance in the history of recording media. Production of the Soundmirrors continued to late 1954 so it is possible to date the tape as being recorded some time between 1948 and 1958. The weight of the spool and the tape is surprisingly heavy, the tape incredibly fragile, marking its passage through time with signs of corrosion and wear. It is a beautiful object, as many of the tapes we get are, that is entwined with the social histories of media, invention, economy and everyday life. In a blog post a few weeks ago we reflected on several practical and ethical questions emerging from our digitisation work. To explore these issues further we decided to take an in-depth look at the British Library’s Digital Preservation Strategy 2013-2016 that was launched in March 2013. The British Library is an interesting case study because they were an ‘early adopter’ of digital technology (2002), and are also committed to ensuring their digital archives are accessible in the long term. The British Library’s collection is huge and therefore requires coherent systems capable of managing its vast quantities of information. All that data needs to be backed up as well. 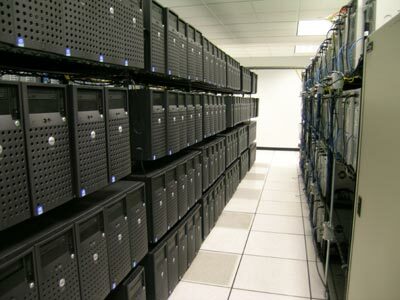 In some cases valuable digital collections are backed up in different locations/ servers seven times (amounting to 35 petabytes/ 3500 terabytes). So imagine it is 2020, and you walk into a large room crammed full of rack upon rack of hard drives bursting with digital information. The data files – which include everything from a BWAV audio file of a speech by Natalie Bennett, leader of the Green Party after her election victory in 2015, to 3-D data files of cunieform scripts from Mesopotamia, are constantly being monitored by algorithms designed to maintain the integrity of data objects. The algorithms measure bit rot and data decay and produce further volumes of metadata as each wave of file validation is initiated. The back up systems consume large amounts of energy and are costly, but in beholding them you stand in the same room as the memory of the world, automatically checked, corrected and repaired in monthly cycles. 300 years, are you sure? The British Library isolate three main areas where digital technologies differ from their analogue counterparts. Firstly there is the issue of ‘proactive lifestyle management‘. This refers to how preservation interventions for digital data need to happen earlier, and be reviewed more frequently, than analogue data. Secondly there is the issue of file ‘integrity and validation.’ This refers to how it is far easier to make changes to a digital file without noticing, while with a physical object it is usually clear if it has decayed or a bit has fallen off. This means there are greater risks to the authenticity and integrity of digital objects, and any changes need to be carefully managed and recorded properly in metadata. ‘The media upon which digital materials are stored is often unstable and its reliability diminishes over time. This can be exacerbated by unsuitable storage conditions and handling. 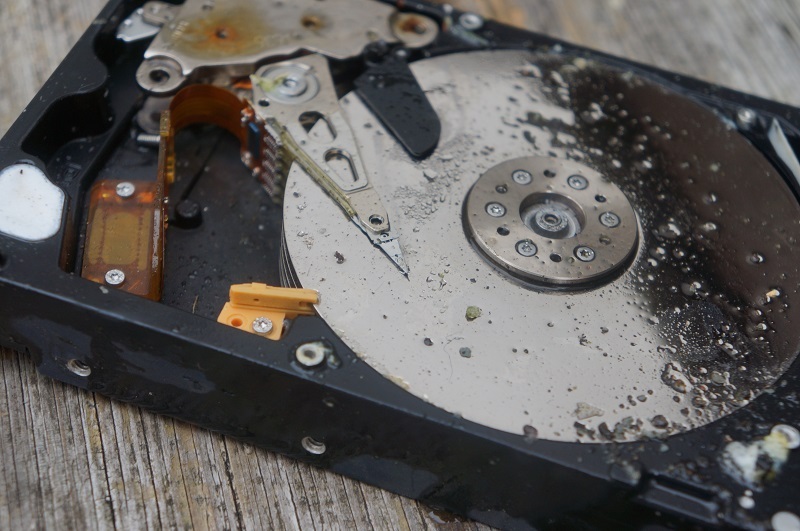 The resulting bit rot can prevent files from rendering correctly if at all; this can happen with no notice and within just a few years, sometimes less, of the media being produced’. Establishing best practice for digital preservation remains a bit of an experiment, and different strategies such as migration, emulation and normalisation are tested to find out what model best helps counter the real threats of inaccessibility and obsolescence we may face in 5-10 years from now. What is encouraging about the British Library’s strategic vision is they are committed to ensuring digital archives are accessible for years to come despite the very clear challenges they face. We have already written about noise reduction this week, but did so without acknowledging the life of Ray Dolby, one of the inventors of video tape recording while working at Ampex and the inventor and founder of Dolby Noise Reduction, who died on 12 September 2013. 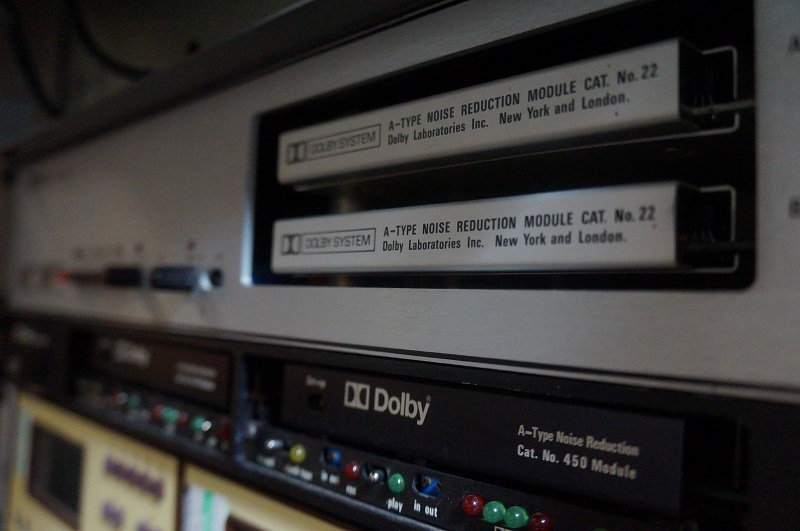 Dolby managed to solve a clear problem blighting analogue tape recording: the high frequency noise or tape hiss inherent when recording on magnetic tape. 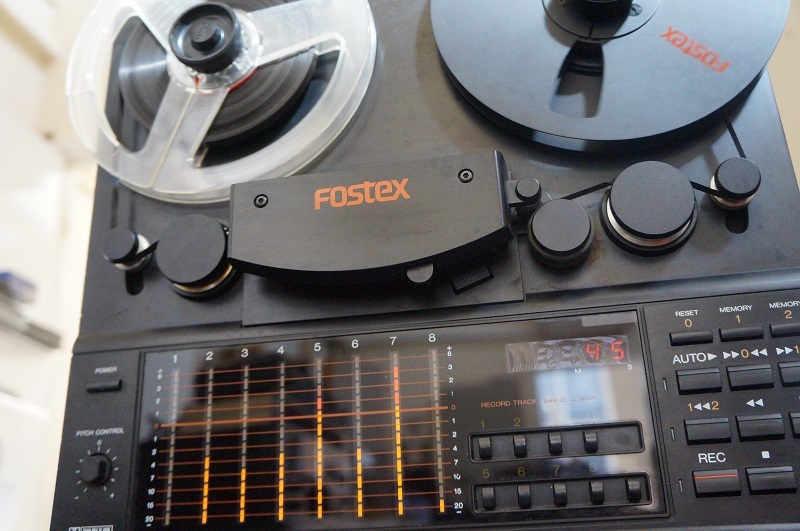 Like many professional recording studios from the 1960s onwards, the Great Bear Studio uses the Dolby A noise-reduction system that we use to play back Dolby A encoded tape. On the Dolby A the input signal is split into four individual frequency bands and provided 10 dB of broadband noise reduction overall. We also have a Dolby SR system that was introduced in 1986 to improve upon analogue systems and in some cases surpass rapidly innovating digital sound technologies. Dolby SR maximises the recorded signal at all times using a complex series of filters that change according to the input signal and can account for up to 25dB noise reduction. 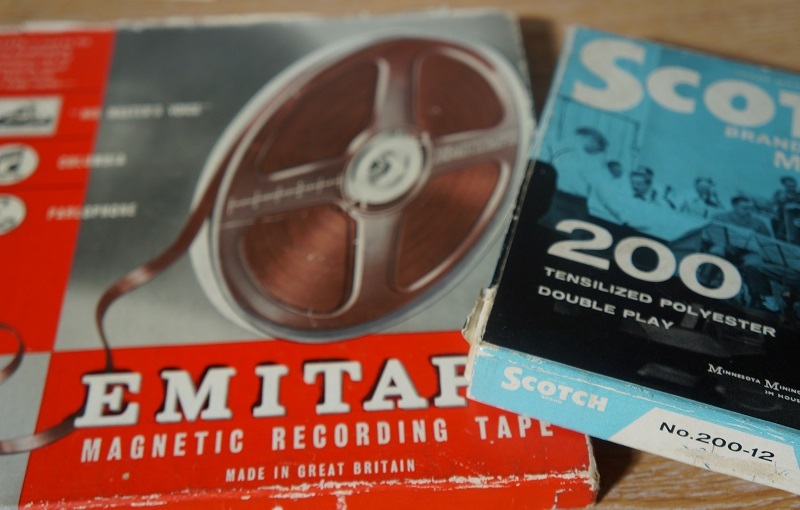 We get a range of tape and video recordings to digitise at the Great Bear. Our attention is captured daily by things which are often unusual, interesting and historically significant in their own way. Last week we received a recording of Pilot Officer Edwin Aldridge ‘Finn’ Haddock talking about his experiences in the Second World War. Finn, who has since passed away, had made the tape in preparation for a talk he was doing at a local school, using the recording in order to rehearse his memories. Despite the dramatic nature of the story where he is shot down in Northern France, sheltered by the French resistance and captured by the Germans, it is told in a remarkably matter of fact, detached manner. This is probably because the recording was made with no specific audience in mind, but was used to prompt his talk. Finn’s story gives us a small insight into the bravery and resilience of people in such exceptional circumstances. The recording tells us what happened in vivid terms, from everyday facts such as what he ate during his shelter and capture to mass executions conducted by the Gestapo. The now digitised tape recording, which was sent to us by his niece, will be shared among family members and a copy deposited with the local history club in Wheatley Hill, where Finn was born. Finn was also interviewed by the Imperial War Museum about his experiences, which can be accessed if you click on this link. On a technical note, when we were sent the tape we were asked if we could reduce the noise and otherwise ‘clean up’ the recording. While the question of how far it is reasonable to change the original recording remains an important consideration for those involved in digital archiving work, as was discussed last week on the Great Bear tape blog, there are some things which can be done if there is excessive hiss or other forms of noise on a recording. The first step is to remove transient noise which manifest as clicks and pops which can affect the audibility of the recording. Family home recordings that were made with cheap tape recorders and microphones often picked up knocks and bangs, and there were some on Finn’s tape that were most probably the result of him moving around as he recorded his story. The second step is to deploy broadband noise reduction, which removes noise across the audio spectrum. To do this we use high pass and low pass filters which effectively smooth off unwanted noise at either end of the frequency range. The limited frequency range of the male voice means that it is acceptable to employ filters at 50 Hz (high pass) and 8000 Hz (low pass) and this will not affect the integrity of the recording. It is important to remember that noise reduction is always a bit of a compromise because you don’t want to clean something up to the extent that it sounds completely artificial. This is why it is important to keep the ‘raw’ transfer as well as an uncompressed edited version because we do not know what noise reduction techniques may be available in five, ten or twenty years from now. Although we have a lot of experience in achieving high quality digital transfers at the Great Bear, any editing we do to a transfer is only one person’s interpretation of what sounds clear or appropriate. We therefore always err on the side of caution and provide customers with copies of uncompressed raw, edited and compressed access copies of digitised files. 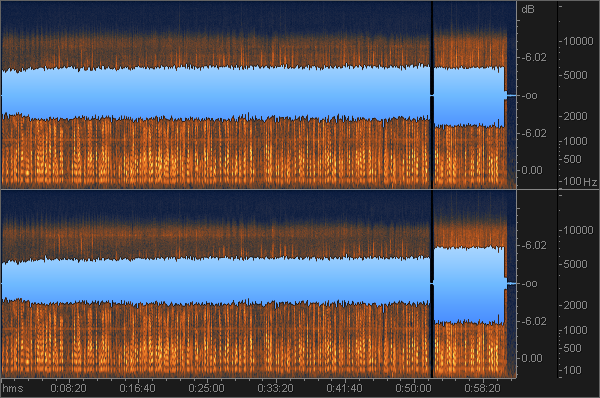 A further problem in noise reduction work is that it is possible to push noise reduction technology too much so that you end up creating ‘artefacts’ in the recording. Artefacts are fundamental alterations of the sound quality in ways that are inappropriate for digitisation work. Another thing to consider is destructive and non-destructive editing. 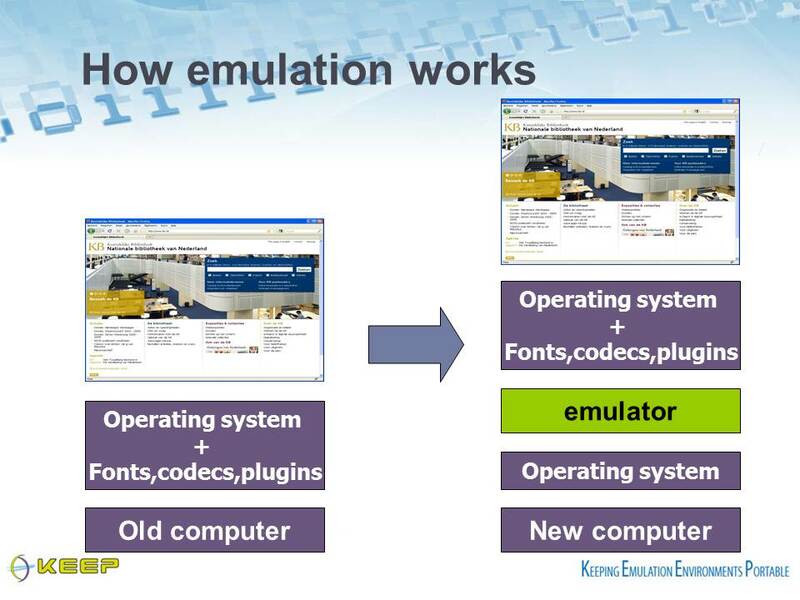 Destructive editing is when a recording has been processed in software and changed irrevocably. Non-destructive editing, not surprisingly, is reversible, and Samplitude, the software we use at the Great Bear, can save all the alterations made to the file so if certain editing steps need to be undone they can be. Again, while in essence the principles of digital transfer are simple, the intricacies of the work are what makes it challenging and time consuming. 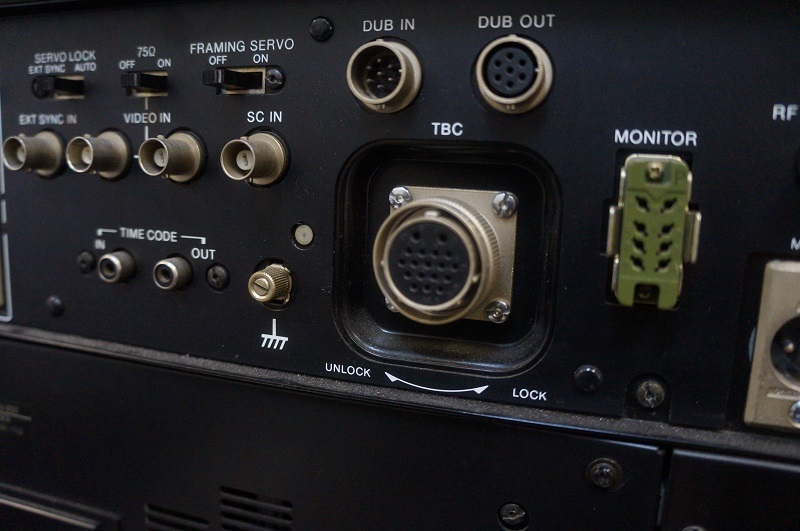 In a 2012 report entitled ‘Preserving Sound and Moving Pictures’ for the Digital Preservation Coalition’s Technology Watch Report series, Richard Wright outlines the unique challenges involved in digitising audio and audiovisual material. ‘Preserving the quality of the digitized signal’ across a range of migration processes that can negotiate ‘cycles of lossy encoding, decoding and reformatting is one major digital preservation challenge for audiovisual files’ (1). Wright highlights a key issue: understanding how data changes as it is played back, or moved from location to location, is important for thinking about digitisation as a long term project. When data is encoded, decoded or reformatted it alters shape, therefore potentially leading to a compromise in quality. This is a technical way of describing how elements of a data object are added to, taken away or otherwise transformed when they are played back across a range of systems and software that are different from the original data object. To think about this in terms which will be familiar to people today, imagine converting an uncompressed WAV into an MP3 file. You then burn your MP3s onto a CD as a WAV file so it will play back on your friend’s CD player. The WAV file you started off with is not the same as the WAV file you end up with – its been squished and squashed, and in terms of data storage, is far smaller. While smaller file size may be a bonus, the loss of quality isn’t. 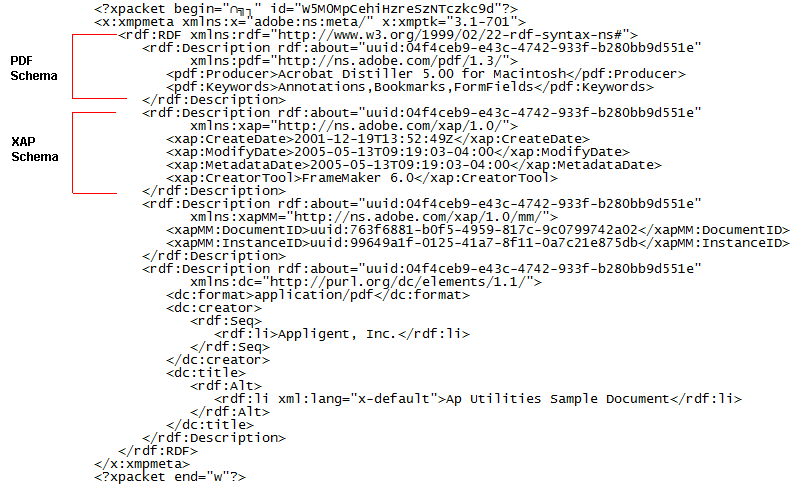 But this is what happens when files are encoded, decoded and reformatted. Subjecting data to multiple layers of encoding and decoding does not only apply to digital data. Take Betacam video for instance, a component analogue video format introduced by SONY in 1982. If your video was played back using composite output, the circuity within the Betacam video machine would have needed to encode it. The difference may have looked subtle, and you may not have even noticed any change, but the structure of the signal would be altered in a ‘lossy’ way and can not be recovered to it’s original form. The encoding of a component signal, which is split into two or more channels, to a composite signal, which essentially squashes the channels together, is comparable to the lossy compression applied to digital formats such as mp3 audio, mpeg2 video, etc. A central part of the work we do at Great Bear is to understand the changes that may have occurred to the signal over time, and try to minimise further losses in the digitisation process. 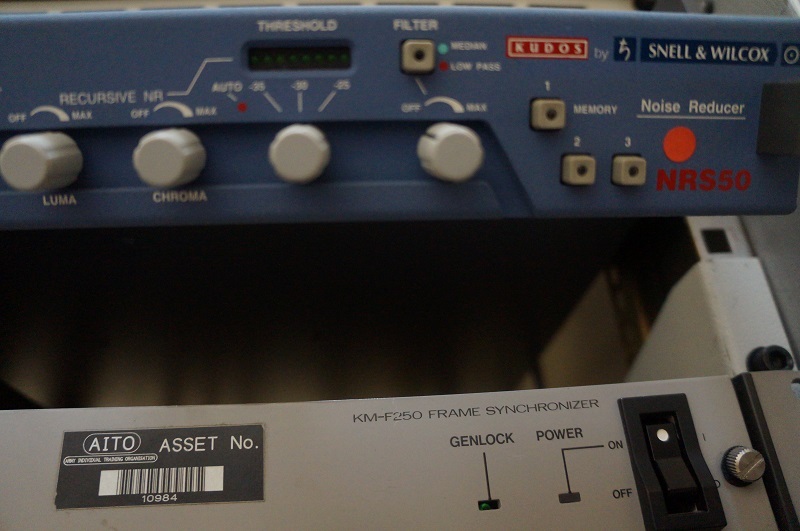 We use a range of specialist equipment so we can carefully measure the quality of the analogue signal, including external time based correctors and wave form monitors. We also make educated decisions about which machine to play back tapes in line with what we expect the original recording was made on. If we take for granted that any kind of data file, whether analogue or digital, will have been altered in its lifetime in some way, either through changes to the signal, file structure or because of poor storage, an important question arises from an archival point of view. What do we do with the quality of the data customers send us to digitise? If the signal of a video tape is fuzzy, should we try to stabilise the image? If there is hiss and other forms of noise on tape, should we reduce it? Should we apply the same conservation values to audio and film as we do to historic buildings, such as ruins, or great works of art? Should we practice minimal intervention, use appropriate materials and methods that aim to be reversible, while ensuring that full documentation of all work undertaken is made, creating a trail of endless metadata as we go along? Do we need to preserve the ways magnetic tape, optical media and digital files degrade and deteriorate over time, or are the rules different for media objects that store information which is not necessarily exclusive to them (the same recording can be played back on a vinyl record, a cassette tape, a CD player, an 8 track cartridge or a MP3 file, for example)? Or should we ensure that we can hear and see clearly, and risk altering the original recording so we can watch a digitised VHS on a flat screen HD television, in line with our current expectations of media quality? Richard Wright suggests it is the data, rather than operating facility, which is the important thing about the digital preservation of audio and audiovisual media. ‘These patterns (for film) and signals (for video and audio) are more like data than like artefacts. The preservation requirement is not to keep the original recording media, but to keep the data, the information, recovered from that media’ (3). Yet it is not always easy to understand what parts of the data should be discarded, and which parts should kept. Audiovisual and audio data are a production of both form and content, and it is worth taking care over the practices we use to preserve our collections in case we overlook the significance of this point and lose something valuable – culturally, historically and technologically. Curating Digital Information or What Do You With Your Archive? Today is the first day of iPres 2013, the 10th international conference on the preservation of digital objects held in Lisbon, Portugal. To mark the occasion we want to reflect on an issue that is increasingly important for the long term management of digital data: curation. As well as the necessary and sometimes difficult choices archival organisations have to make in the process of collecting an archive, there is then the issue of what to do with your data once it has been created. This is where the issue of digital curation comes in. Traditionally, the role of the curator is to ‘take care’ and interpret collections in an art gallery or a museum. In contemporary society, however, there is an increasing need for people to curate collections that are exclusively digital, and can only be accessed through the web. Part of any long term digitisation strategy, particularly if an archive is to be used for education or research purposes, should therefore factor in plans and time for curation. Curation transforms a digital collection from being the equivalent of a library, which may be searchable, organised and catalogued, into something more akin to an exhibition. Curation helps to select aspects of an archive in order to tell deliberate stories, or simply help the user navigate content in a particular way. Curating material is particularly important if an archive deals with a specialist subject that no one knows about because visitors often need help to manoeuvre large amounts of complex information. Being overwhelmed by content on the internet is an often cited expression, but ensuring digital content is curated carefully means it is more likely that people visiting your site will be able to cope with what they find there, and delve deeper into your digitsed archival treasures. Like all things digital, there is no one steadfast or established guidelines for how to ensure your collection is curated well. The rapid speed that technology changes, from preferred archival formats, software to interface design, mean that digital curation can never be a static procedure. New multiple web authoring tools such as zeega, klynt and 3WDOC will soon become integrated into web design in a similar fashion to the current Web 2.0 tools we use now, therefore creating further possibilities for the visual, immersive and interactive presentation of digital archive material. Curation is an important aspect of digital preservation in general because it can facilitate long term use and engagement with your collection. What may be lost when archive sites become pruned and more self-consciously arranged is the spontaneous and sometimes chaotic experience of exploring information on the web. Ultimately though, digital curation will enable more people to navigate archival collections in ways that can foster meaningful, transformative and informative encounters with digitised material. As lovers of magnetic tape and obsolete media, we keep our eyes open for people who remain attached to the formats most have forgot. A recent film posted on Vimeo features the creative life of part time chef, noise musician and tape DJ Micke, also known as ‘The Magnetist’. The film follows the Stockholm-based artist through his life as a ‘tapeologist.’ From demagnetising tape in order to create soundscapes, to running a club night comprised of tapes scavenged from wherever he can find them, Micke demonstrates how the audio cassette remains a source of inspiration within counter culture. The Magnetist from Filibuster on Vimeo. The wider resurgence of cassettes is evident from the forthcoming Cassette Store Day, an event that will be marked in record stores in the UK, USA, Europe and South America. New tape labels are popping up all the time. Tapes are now often preferred to CD-Rs for short run albums in do it yourself punk culture, as releases blur the line between art object and collector item. So what’s behind the sub-cultural obsession with the audio cassette tape? Perhaps it is no more complex than novelty value and nostalgia. It may however be evidence of the persistence of analogue technologies in an era where digital technologies appear to have colonised our relationship to sound and vision. Is there a yearning to resist the ways digital media shapes how we listen to music, both at the level of sound quality, and the promiscuous skipping through mp3 files? You simply can’t do that with tape. You have to rewind, fast forward or listen the whole way through. Its a mechanical process, often shrouded in hiss. What is certain, fashion or no fashion, the wheels on the Great Bear tape machines will keep turning. In archiving, the simple truth is formats matter. If you want the best quality recording, that not only sounds good but has a strong chance of surviving over time, it needs to be recorded on an appropriate format. Most of us, however, do not have specialised knowledge of recording technologies and use what is immediately available. Often we record things within limited budgets, and need to make the most of our resources. We are keen to document what’s happening in front of us, rather than create something that will necessarily be accessible many years from now. At the Great Bear we often receive people’s personal archives on a variety of magnetic tape. Not all of these tapes, although certainly made to ensure memories were recorded, were done on the best quality formats. 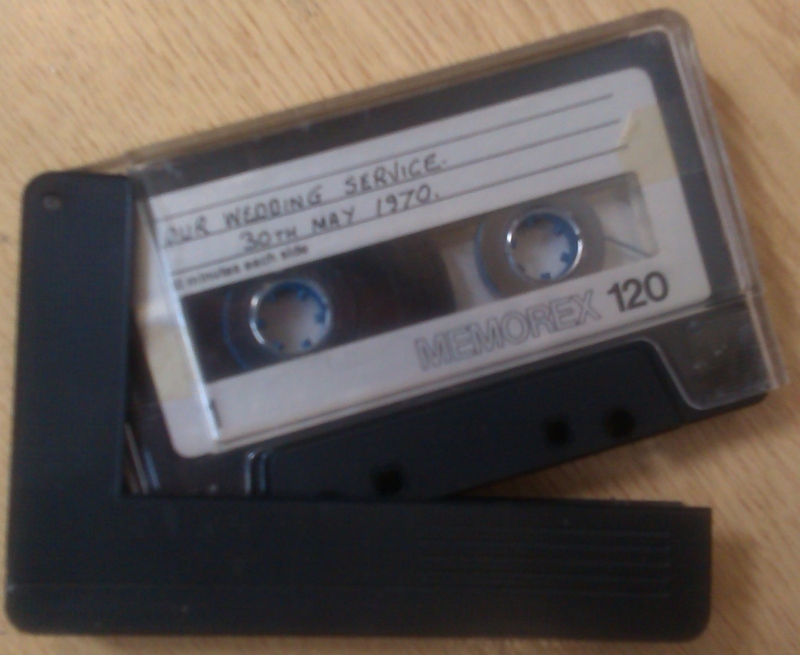 Recently we migrated a recording of a wedding service from 1970 made on C-120 audio cassette. C60 and C90 tapes are probably familiar to most readers of this blog, but the C-120 was never widely adopted by markets or manufacturers because of its lesser recording quality. The C-120 tape records for an hour each side, and uses thinner tape than its C90 and C60 counterparts. This means the tape is more fragile, and is less likely to produce optimum recordings. Thinner tapes is also more likely to suffer from ‘print-through‘ echo. The manual goes on to stress ‘Nakamichi does not recommend the use of C-120 or ferrichrome cassettes under any circumstances.’ Strong words indeed! It is usually possible to playback most of the tape we receive, but a far greater risk is taken when recordings are made on fragile or low quality formats. The question that has to be thought through when making recordings is: what are you making them for? If they are meant to be a long term record of events, careful consideration of the quality of the recording format used needs to be made to ensure they have the greatest chance of survival. Such wisdom seems easy to grasp in retrospect, but what about contemporary personal archives that are increasingly ‘born digital’? The issue of format quality also comes to the fore with the type of everyday records we make of our digital lives. The images and video footage we take on smart phones, for example, are often low resolution, and most people enjoy the flexibility of compressed audio files. In ten years time will the records of our digital lives look pixelated and poor quality, despite the ubiquity of high tech capture devices used to record and share them? Of course, these are all speculations, and as time goes on new technologies may emerge that focus on digital restoration, as well as preservation. Ultimately, across analogue and digital technologies the archival principles are the same: use the best quality formats and it is far more likely you will make recordings that people many years from now can access.